The younger of the two daughters of Saul, probably by Ahinoam (I Sam. xiv. 49-50). David, then a boy of about sixteen, was to have married her sister Merab; but the latter having been given to another, and Michal having fallen in love with David, Saul consented to the marriage of the two last-named, not insisting on the customary dowry ("mohar"), but requiring that David kill a hundred Philistines. 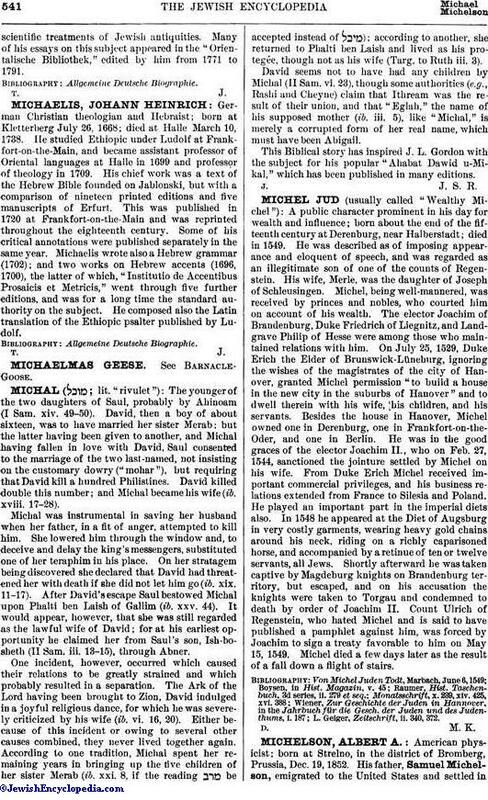 David killed double this number; and Michal became his wife (ib. xviii. 17-28). Michal was instrumental in saving her husband when her father, in a fit of anger, attempted to kill him. She lowered him through the window and, to deceive and delay the king's messengers, substituted one of her teraphim in his place. On her stratagem being discovered she declared that David had threatened her with death if she did not let him go (ib. xix. 11-17). After David's escape Saul bestowed Michal upon Phalti ben Laish of Gallim (ib. xxv. 44). It would appear, however, that she was still regarded as the lawful wife of David; for at his earliest opportunity he claimed her from Saul's son, Ish-bosheth (II Sam. iii. 13-15), through Abner. One incident, however, occurred which caused their relations to be greatly strained and which probably resulted in a separation. The Ark of the Lord having been brought to Zion, David indulged in a joyful religious dance, for which he was severely criticized by his wife (ib. vi. 16, 20). Either because of this incident or owing to several other causes combined, they never lived together again. According to one tradition, Michal spent her remaining years in bringing up the five children of her sister Merab (ib. xxi. 8, if the reading be accepted instead of ); according to another, she returned to Phalti ben Laish and lived as his protegée, though not as his wife (Targ. to Ruth iii. 3). David seems not to have had any children by Michal (II Sam. vi. 23), though some authorities (e.g., Rashi and Cheyne) claim that Ithream was the result of their union, and that "Eglah," the name of his supposed mother (ib. iii. 5), like "Michal," is merely a corrupted form of her real name, which must have been Abigail. This Biblical story has inspired J. L. Gordon with the subject for his popular "Ahabat Dawid u-Mikal," which has been published in many editions.